Most children love bike riding and kids bikes are a great way for children to exercise. Furthermore, both parents and children can go cycling together and have a great time. You can plan a bike ride and choose a route that both you and your child will enjoy (for example, you can go through a forest, park, by a river or an interesting location). You can also look for bike trails in your area. Actually cycling is a great way to escape the routine of daily life. Cycling can offer a good exercise. It can be a good cardio exercise and a good work out for the legs, arms and back muscles. Studies have also shown that regular cycling can help overweight children loose weight. Younger children (ages 3-5) can start with a tricycle or with a balance bike. Starting from the age of 5, as children have acquired a good balance and learned how to pedal and steer, you can get a regular two-wheeler bicycle. You can attach training wheels to these kids bikes at the beginning so that children build up confidence. For kids ages 5-8 (boys and girls), we recommend the Diamondback Mini Viper Kid's BMX Bike. Kids that age should get a bike that will help them learn how cycle. We think that this bike fits the bill. It is very sturdy. Diamondback is known to manufacture good quality bikes. It is a BMX bike for kids and a great way for them to acquire their first cycling skills. After you have checked the bike sizes for kids, make sure you buy a helmet and that your child wears a helmet. Encourage him or her to do so. Cycling can be dangerous and helmets can really protect the child from serious head injury. If you ride at night make sure that you equip the bike with front and back light. We recommend the Razor V-17 Helmet. The helmet is comfortable, sturdy, high quality and easy to adjust. Unlike other helmets it protects the entire head (even the lower part). It also has side vents which keep the head cool on hot summer days. This specific helmet is for children ages 8 to 14. For children 5 to 8, make sure you get the smaller size model (model 97780). You should get a good quality bike but for a reasonable price as your child will outgrow his or her bike in a few years. You can get away with a bike costing less than $250. It will probably not be as light as some adult bikes being made entirely of steel, but it will be very sturdy. The most important about kids bikes is to have a bike with good frames and good brakes (coaster brakes for younger children and hand brakes or both for older children). We like mountains bikes because they are sturdy and because they can be used anywhere. A good boys' bike starting from age 8 is the Diamondback Cobra 20 Junior Boys Mountain Bike. This bike is for children who already know how to ride a bike. The breaks are hand brakes and not coaster brakes. The wheels are 20 inches. It is entirely made of steel and it is a very sturdy bike. We also like the fact that it has a suspension fork and we love its appearance. 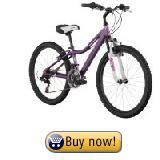 If you are looking for a girl's bike, we recommend the Diamondback Girl's Lustre Mountain Bike (for ages 8 and up). The wheels are 20 inches. It also has a suspension fork and alloy rims. The bike looks really nice and is sure to appeal to your little girl!